David Levy Yulee (1810-1886) was an attorney, planter, entrepreneur, and statesman, who was instrumental to Florida’s Statehood, and its development via the Florida Railroad. He was born on the Island of St. Thomas, Virgin Islands, on June 12, 1810 to Moses Elias Levy, a successful merchant and landowner of Moroccan Sephardi Jewish descent, and his wife Hannah. His parents divorced in 1815, and David came to Florida with his father, before being sent to boarding school in Norfolk, Virginia. He returned to Florida as a young man, and studied law in St. Augustine under future Territorial Governor Robert Reid (1839-1841). David Levy was admitted to the Florida Bar in 1832. He began his political career as a delegate to Florida’s state constitutional convention in 1838, and later became a clerk for the territorial legislature. In 1841 he was elected to the U.S. House of Representatives as a delegate from the Florida Territory. Levy was a tireless champion of Florida’s statehood, and was part of an assembly responsible for drafting the new state’s constitution. 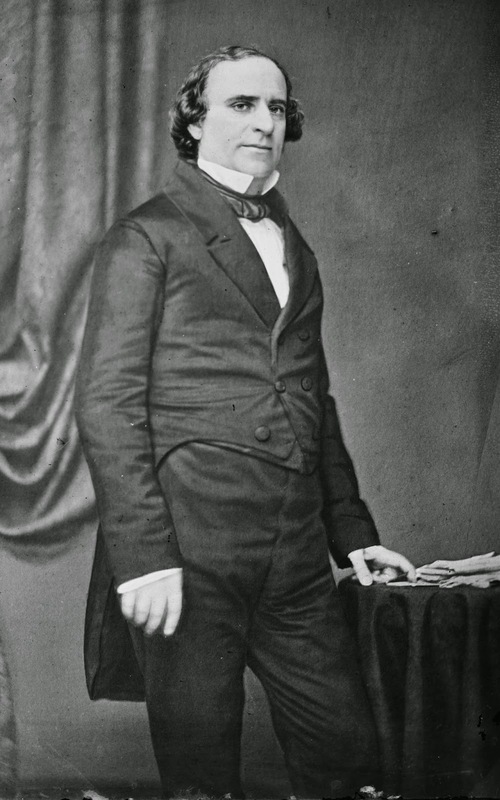 When Florida entered the Union on March 3rd, 1845, he became one of the state’s first new senators – and the first Jewish member of the U.S. Senate. In 1846 Levy married Nannie Wickliffe (daughter of former Kentucky Governor Charles A. Wickliffe), and officially changed his name to David Levy Yulee by an act of Florida Legislature. Senator Yulee served as chairman of the Committee of Private Land Claims, and the Committee of Naval Affairs. After failing to win a bid for reelection in 1851 (in a controversial decision), Yulee began to focus on his plan for a cross-state Florida Railroad, with one terminus on the West Coast of the state at Cedar Key, and the other on the East Coast at Fernandina. Yulee established the railroad’s main office at Fernandina, but finding the town’s original location unsuitable, he convinced most of Fernandina’s residents to relocate the center of town approximately one mile south - to its present location. Yulee envisioned Fernandina as “the Manhattan of the South,” and had the new town plotted accordingly (complete with its own Central Park). Yulee returned to the U.S. Senate in 1855, and was an advocate of states’ rights and later secession from the Union. His fierce views and passionate oration led his fellow senators to refer to him as the “Florida Fire Eater.” Yulee believed that if the number of free states in the Union outnumbered the slave states, the south would be overwhelmed by the north politically. This view, along with allowing his children to be raised Christian, estranged Yulee from his father, Moses Levy. Construction began on the Florida Railroad in September of 1855. As with most of the track laid in the south before the Civil War, the work was done mostly by slaves, supplemented by freedmen and white laborers. Fighting their way through dense forests and swamps, it took almost a year to lay down the first ten miles of track. Despite nearly facing bankruptcy in the Panic of 1857, the line between Fernandina and Cedar Key was completed in 1860. The first train from Fernandina arrived in Cedar Key on March 1st, 1861, just weeks before shots were fired on Fort Sumter. Yulee resigned from the U.S. Senate on January 21, 1861, and returned to Florida to protect his railroad and supervise his plantations. Though he was never officially linked to the Confederacy, Yulee corresponded with Confederate officials, including President Jefferson Davis, and Attorney General (later Secretary of War and Secretary of State) Judah P. Benjamin – who was Yulee’s second-cousin. The Civil War proved to be destructive for the Florida Railroad. Confederate forces pulled up rails for their own purposes, while the Union Army destroyed 30 miles of track leading to Cedar Key. Union forces captured Fernandina on March 3rd, 1862. David Yulee escaped by train, under fire from the USS Ottawa. Yulee retreated to his plantation near Homosassa, Florida, until it was burned down by Federal troops in 1864. Yulee and his family spent the remainder of the war at “Cottonwood,” his plantation near Archer, Florida. After emancipation Yulee encouraged the education of freedmen, and advocated employing African American men and women as teachers. At the close of the Civil War Yulee was sent to Gainesville, Florida, as part of a delegation to petition for readmission into the Union. He was arrested for treason against the United States and sent to Fort Pulaski. The charge of treason stemmed from the discovery of a letter he had written before his official resignation from the U.S. Senate, which urged Southern forces to occupy forts and seize munitions in Florida. Nannie Wickliffe Yulee used her family’s political connections, and succeeded in convincing General Ulysses S. Grant to intervene on her husband’s behalf. After being paroled in 1866, Yulee returned to Fernandina and worked to rebuild the Florida Railroad. By 1877, financial difficulties forced him to sell his majority share, but he remained active as the railroad’s vice-president until his retirement in 1881. David Yulee and his wife retired to Washington DC, where Nannie passed away in 1881. Yulee died on October 10, 1886, in New York City. In 2000 The Florida Department of State designated Yulee as a Great Floridian. The city of Yulee, Florida, and Levy County are named in his honor. June 12th, 2014 will mark the 204th anniversary of David Yulee’s birth. The Fernandina Restoration Foundation will partner with the Amelia Island Museum of History to celebrate Yulee’s extraordinary life by unveiling a statue in his honor at the historic train depot (102 Centre St) on Thursday, June 12th, at noon. Built in 1899, the depot is in the process of being restored by the public/private partnership of the Amelia Island Tourist Development Council, the City of Fernandina Beach, and the Fernandina Restoration Foundation.